Don't go by reports, by legends, by traditions, by scripture, by logical conjecture, by inference, by analogies, by agreement through pondering views, by probability, or by the thought, 'This contemplative is our teacher.' When you know for yourselves that, 'These qualities are skillful; these qualities are blameless; these qualities are praised by the wise; these qualities, when adopted & carried out, lead to welfare & to happiness' -- then you should enter & remain in them. 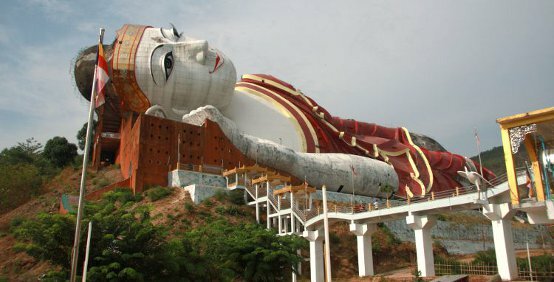 When you visit Myanmar, you will not miss the sight and sound of people from all walks of life paying respect to the statue of the Buddha out of genuine admiration. You will also come across people chanting their prayers as though the Buddha can grant their wishes. As far as I know, the original Buddhist teaching does not mention anything about ya1-da1-ya2, a unique Burmese way to reverse or control kun2-kja1-ma2 for personal benefits and advantages based on lau3-ba1 (greed), dau3-tha1 (hate), and mau3-ha1 (delusion). The word ya1-da1-ya2 has thet-ka1-ta1 (Sanskrit) origin, and probably used by the pone2-na3, who are elite Brahmin class from ancient India. 236 years after the passing away of the Buddha, King Asoka of India known as Ah2-thau3-ka1 Min3-ji3 in Burmese sent out Buddhist missionaries to 9 different regional locations. One of the regions called Thu1-wa1-na1 Bu2-mi is believed to be coastal areas in Indochina including the present day Ta1-nin3-tha2-ri2 region where Mon people live. Sumatra, Indonesia was then known as Thu1-wa1-n1 dri1-pa1. Archeological findings near the town of Pyay2 suggest that Theravada Buddhism had thrived during Pyu Civilization in Tha1-yay2-khit-ta1-ya2 around 400 AD. During 900 AD, pseudo-Buddhism with the mixture of Tan2-dra1 wa2-da1 (Tantric) rituals had reached Bagan, and Tantric religious leaders known as A-yi3-ji3 practiced what could be considered as supernatural and out lun3 methods including taking the virginity of young brides known as pan3-u3-hsoot wa2-da1. Only around 1100 AD, King A-nau2-ra1-hta2 of Bagan had learned about the "true" Buddhism from the Mon civilization at the time of the Mon Buddhist Monk Shin2 A-ra1-hun2, also known as Dun2-ma1 Dut-thi2. The king removed the religion of A-yi3-ji3 and brought Htay2-ra1-wa2-da1 Boat-da1 Ba2-tha2 (Tharavada Buddhism) to Bagan civilization. So you can consider that Buddhism first flourished for the Burmese people in the 11th Century, although the history is much earlier if you count civilizations in lower Burma. 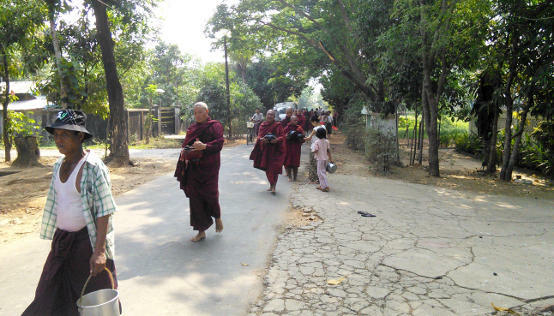 Some Burmese Buddhists include loving kindness in their daily prayer. Basically, myit ta2 thoat or Metta Sutta in Pali Language is a Buddhist way of sending unconditional and tender loving kindness to all creatures big and small, near and far in all directions. Unconditional love is boundless and the most beautiful love of all that gives but not take, answers the cries but not demand, loves not dependent on conditions nor impose conditions, protects but not possessive, and feels but not wish for anything in return. The Buddhist literatures often describe this kind of love as the love of the mother to her only child. pyau3 in Burmese means "to tell". When you double-up hmun2 (adjective), it becomes an adverb hmun2 hmun2, which means "truthfully". a-hmun2 ta1-ya3 is "the Absolute Truth", "the Universal Law" or "Dhamma" as realized by the Buddha where ta1-ya3 refers to the law or fairness. hmun2-hmun2 pyau3 means truthfully tell. This phrase is a request or a reminder not to tell a lie. Here's some truth on what the historical Buddha has to say about good communication as practiced by the Buddha himself, in which "the Right Speech" (one of the Noble Eight Fold Paths) is part of a good communication. There are four aspects of what one should practice in a good communication. First of all, we must not knowingly tell lies not even in jest, or fabricate "facts" that are untrue. No bragging, no exaggeration, and no back-stabbing. In second aspect of "good communication", whatever we say must be pleasant to hear. Try to see positive things even in unpleasant situations. No insults, no nagging, no gossiping, no extortion or threats, and no interfering to break up relations among other people. Thirdly, whatever we say must be relevant and useful to the listener(s). No boring stories and lectures, please! What if the teaching is boring, but useful to the listener(s)? Then, there is the fourth aspect. In the fourth aspect of a good communication, we must find the right time to say what we have to say if the message to be conveyed is unpleasant or a bitter pill to swallow for the listener(s). Be a good listener to determine the right time to say what needs to be said. I must also add, it would be a good idea to include no interruption, no hesitation, no repetition, and stop speaking when it's time to stop. a-chain2 hmun2 hma1 pyau3 -- speak only at the right time. The Buddha's teaching on the Right Speech is beautifully compiled here. Thoat or thoat-tun2 is "sutta" in the Pali and "sermon" in English. In a classic sermon known as Ka2-la2-ma1 thoat, the Buddha challenges his yweare2 tu2 (contemporaries) including laymen, holy men, and truth seekers to test the truth by examining even the Buddha himself. He does not advocate blind-faith. You can read Pali to English translation of Kalama Sutta on www.accesstoinsight.org. In other lectures and suttas, he even advices to abandon the attachment to the Dhamma (the teaching of the Buddha), which is compared to a raft ( pfoun2 in Burmese ) used to cross the troubled waters. Once you reach the safety of the other shore, you must leave the pfoun2 at the bank of the river, rather than carrying it on your shoulder in your onward journey in life. without questioning. This is unlike how the children are taught in the western culture where new discoveries, advancement in science, and break-throughs in technology are made. However, I feel that a fine balance is needed between science, imagination, superstition, and the religion. dun2-ma1-set-kja2 -- The Wheel or the Universal Law (Dhamma-cakka in the Pali); the wheel (realm), or the doctrine started to roll by the Buddha. In the West, this law is better known as The Four Noble Truths. The Burmese Buddhists believe the Buddha appeared in Heavenly World known as Nat Pyi and taught this teaching to his mother Meare2 Dau2 who was re-borned there. It would be tough to sell this "story" to the Westerners. Not surprisingly, Supernatural World that might exist in extra dimensions beyond our 3-dimensional World somewhat like those described by Quantum Physics and Superstring Theory is a low-key subject among Western Buddhist teachers. In fact, in Buddhism, there are 31 planes of existence, with beings in some of the higher planes having life-spans of billions of years. If you consider Einstein's Theory that time is relative, the "stories" mentioned in the texts such as one day in some levels of Heavenly World is equivalent to a week or even years in Human World is not so outrageous. yu2-pa1 khan2-da2 -- Matter - Body sense organs such as eye, ear, nose, tongue, and skin when in contact with external sources produce visible form, sound, odor, taste, tangible things. wi1-nya2-na1 khan2-da2 -- Consciousness - faculty that awares the presence of objects that comes into contact with. way2-da1-na2 khan2-da2 -- Sensation - pleasant (pleasure), unpleasant (pain), or neutral feeling. tha1-nya2 khan2-da2 -- Perception - recognizes what comes into contact. E.g., this flying form visible with eyes is a crow. thin2-kha1-ra1 khan2-da2 -- mental formation - includes the concept of "I", and all volitional activities: attention, will, determination, concentration, greed, hate, desire, conceit, and conditioned responses. E.g., the thought, "I hate crows", and another thought on how to get rid of it. The thought on how to get rid of the crow comes into existence based on conditions. As the crow flies away, that stream of thought ceased to exist. The experience is replaced by other flow of processes. Apart from those flow of processes, there is no permanent entity or "soul" lurking around. Our experience of "I" is like a river. A river gives the illusion of permanence and unchanging existence. But, the fact is that apart from changing flow of water, there is no such thing as a permanent river. If you come back the next day, it is already replaced by new water drops. Our experience of "I" is like a movie with a frame of picture for every moment. A thought that occupies just a single frame assumes that the whole movie is "I". A mind that sees this illusion understands Anatta. When the illusion of "I" drops, so are greed, hate, and conceit. This illusion is the root-cause of our suffering (Dukkha). If one summarizes the whole teaching of Buddha, it is about Dukkha, the cause of Dukkha, and ways to end Dukkha. The word "kamma" or "Karma" may be familiar to many Westerners, but not all of them may understand the deep meaning behind it. sate sun2-da1 (Volition) or yi2-yweare2-chet (intention) plays a major role in this chain of actions and their consequences. Unlike the Newton's law of cause and effect as understood by modern science, those consequences may not necessarily follow right away at the moment of action, and therefore it is hard to associate actions with their consequences. In Buddhism, this applies even to a single thought moment of misdeed. (Misdeed here refers to greed, hate, and delusion). It should be noted, however, that there is no "final judgement day" by the Arbitrator as in other faith and belief systems. You will be either punished or rewarded by your own deeds good or bad. For details on the Law of Kamma, please refer to audio lessons by Bhikkhu Bodhi, an American Buddhist monk and leading authority on Theravada Buddhism, and teachings by Gil Fronsdal. This lesson is not about preaching Buddhism, nor do I practice what I type all the time, so let's get back to Burmese words on Kamma. It should be noted that the average Burmese person tend to equate "luck" or "random chance" with kun2 as in kun2-sun3-meare3 or "lucky draw", which deviates from the original teaching of the Buddha. Finding one's own kun2-kja1-ma2 could also mean finding one's true love. If Anatta is true and there is no permanent soul, then who gets the results of our "karmic" actions good or bad? 'When the Aggregates arise, decay, and die, bhikkhu, every moment you are born, decay, and die.' Thus even now during this life time, every moment we are born and die, but we continue. If we can understand that in this life we can continue without a permanent, unchanging substance Self or Soul, why can't we understand that those forces themselves can continue without a Self or Soul behind them after the non-functioning of the body? A person who dies here and is reborn elsewhere is neither the same person, nor another (Pali: na ca so na anno). kun2-kja1-ma2 has some aspects of determinism in that the past has been fixed. But, there is free-will in the present, which will determine the future in the direction of applied forces and resulting momentum of the past just like the billiard balls on the pool table. Our journey in life that we walked so far is the consequence of previous deeds-- good or bad. Chances are high that the past actions and choices that we have made will still have influence on the outcome of our kun2-kja1-ma2 well into the future. But, right now-- here and now at this moment-- we have freedom to make the choice. The choice is ours and so is the responsibility. Our kun2-kja1-ma2 in the future has not been written yet! If ya1-da1-ya2 makes any sense at all, our actions from here and now onward will be the driving force that may even alter and reverse our kun2-kja1-ma2. If our deeds, actions, speech, and intentions are positive, pure, and free from lau3-ba1 (greed), dau3-tha1 (hate), and mau3-ha1 (delusion), our future written in the stars, and more importantly in this blue planet that we called Earth, will be a bright one. What do you mean by "Tha2 du1"? "May what I am about to wish come true!" When ya1-hun3 and thun2-ga2 (order of Buddhist monks), say tha2-du1 three times, it is understood as "Excellent! Excellent! Excellent!" Most Burmese Buddhists can at least recite this prayer even if they don't deeply understand the meaning. I spent some time to understand the meaning of difficult Pali words myself, and spent even more time in translation of the whole prayer into English. Read my translation of Au3-ka2-tha1 with Burmese Script. pfa1-ya3 -- refers to the Buddha by the Buddhists. ta1-ya3 -- Dhamma or the Universal Law taught by the Buddha. pa1-hto3 -- temple where there is space inside the structure for worshipping. "May you find peace, tranquility, and happiness. May the force be with you-- always!"